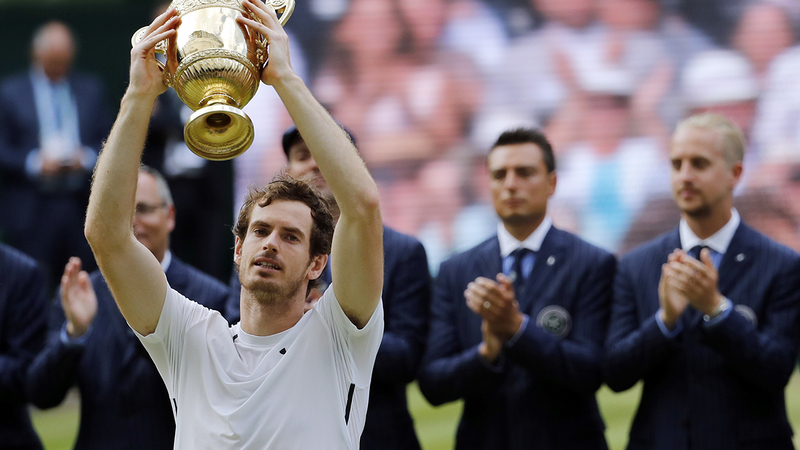 LONDON -- After Britain famously endured a 77-year wait between Wimbledon men's champions, Andy Murray has given the host country a pair of titles in quick succession. Murray dulled booming serves with quick-reflex returns, played impressively mistake-free tennis while coming up with daring passing shots and beat Milos Raonic 6-4, 7-6 (3), 7-6 (2) on Sunday for his second trophy at the All England Club since 2013 and third Grand Slam championship overall. When he sat in his sideline chair after it was over, Murray wiped away tears with a tournament towel. The second-seeded Murray was playing in his 11th major final, but the first against someone other than Novak Djokovic or Roger Federer. But he didn't need to face either of those rivals this fortnight: The sixth-seeded Raonic eliminated Federer in five sets in the semifinals Friday, and also defeated the player who stunned Djokovic in the third round, Sam Querrey. Those wins helped the 25-year-old Raonic make his debut in a Grand Slam title match - the first man representing Canada to make it that far at one of the sport's four most important tournaments. He did it, primarily, on the strength of his speedy and intimidating serves, averaging 25 aces while being broken a total of only five times through six matches. But on a breezy afternoon, at a Centre Court filled with nearly 15,000 partisan fans, Murray basically shut down that integral part of Raonic's game. It's been a rough few weeks for Britain, what with its vote to leave the European Union, the resulting drop of the pound's value, and the subsequent resignation of Prime Minister David Cameron, who was seated in the front row of the Royal Box on Sunday, several seats over from Prince William and his wife, Kate. Murray was even asked by a reporter during Wimbledon how it felt being Britain's "last hope," a question he jokingly dismissed by replying, "It's not that bad, is it? Is it that bad?" Murray, a 29-year-old from Scotland, long dealt with the expectations and pressures that accompanied being the locals' best chance to find a new champion to succeed Fred Perry, who won the tournament in 1936. But Murray has thrived, with a counter-punching, defensive game and sublime returns of serve. In a testament to Murray's ability as a returner - a combination of timing and dexterity - it took Raonic 36 minutes and five service games to record his first ace. Over and over, Murray managed to get the ball back, even one that came in at 147 mph. Raonic was limited to eight aces in all, only one more than Murray. And while Murray only managed to break Raonic once, to lead 4-3 in the opening set, that was all it took, because the tiebreakers were both one-way traffic. Just as significant: Murray took 50 of 65 points he served across the first two sets, not only never facing so much as a break point in that span but only once being taken to deuce. Finally, at 2-all in the third, Raonic got to 15-40 for his first - and, it turned out, only - break points, thanks to a forehand return winner off an 82 mph second serve. But Murray stood tall, taking the next four points to hold, then wheeling toward his box, pumping his right fist and yelling. He was well on his way, thanks to such clean play that he finished with a mere 12 unforced errors, while Raonic had 29.